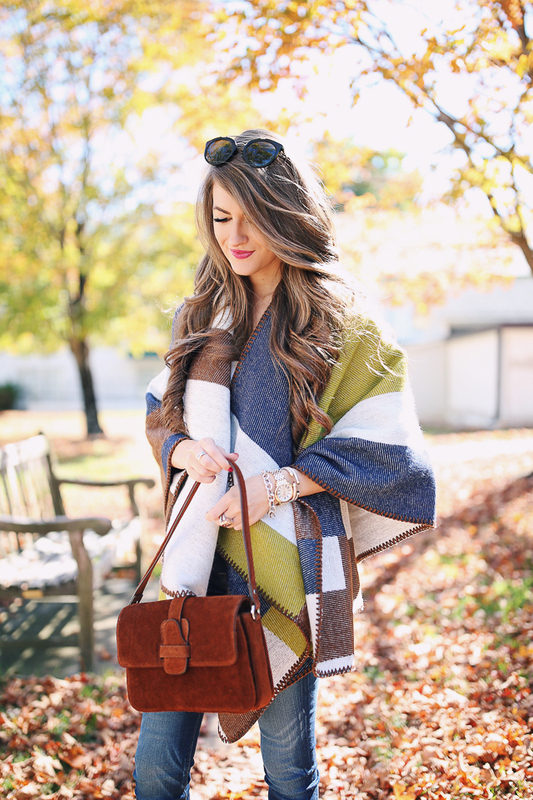 Ponchos are one of the easiest fall “outfit makers” – you can throw them on over pretty much any outfit! I’m particularly loving this one from Banana Republic (if it’s too colorful for you, try this neutral one). I love ponchos over dresses, camis and turtlenecks and paired with booties or over-the-knee boots. There are so many ways to style them! P.S. This suede handbag is straight from the Banana Republic’s runway at NYFW. Isn’t it gorgeous?! I’m linking up some of my favorite Banana Republic pieces below! LOVE the poncho. 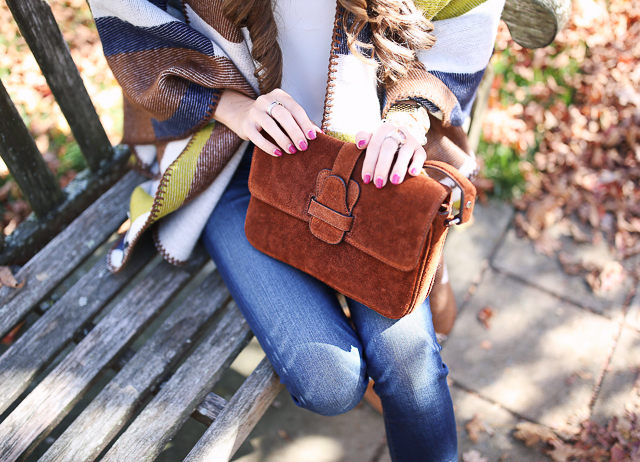 Such a perfect accessory for fall. Great outfit! Love the poncho, it's such an easy piece to throw on and you have a great outfit. I've never tried ponchos before but they seem so cozy and warm! Love your poncho! Ponchos are one of my favorite piece for fall! I've always wanted to get a poncho! You make it look so cute! That poncho looks so cozy!! SUCH a cute outfit! Love the colors in the poncho! How gorgeous it this poncho! It looks so cozy and cute! I love ponchos and this one is totally "my style"!!! Beautiful photos, location is so magical! I'm absolutely loving the colors in this poncho! So fun! I LOVE that I can come to your page every morning and there is always a new post!! You are so committed, and it shows. I truly appreciate your passion! Have you done a hair tutorial lately? Your curls are always perfect!! 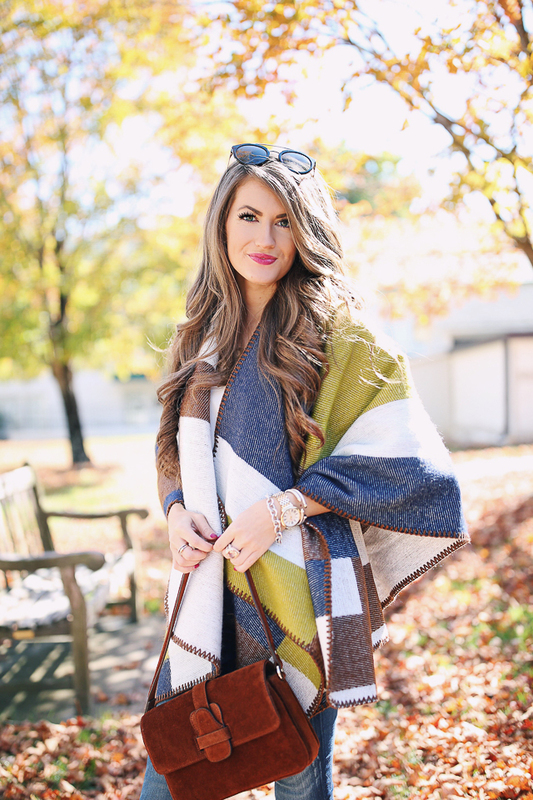 This poncho is fall-esque and colorful. I love adding pops of color to my fall wardrobe. Well done lady. I Love this Pocho and the hole Look. I´m absolutely in love with this style. I love the pop of green on the poncho! Unfortunately here it's gotten so cold we've skipped right past the fall wear into winter clothes. Hopefully the nice fall weather comes back for a little. I love poncho ..especially in these first days of fall!!! I love that poncho! Such a nice change of colors for fall! love this look Caitlin! I am obsessed with ponchos! Where can I get a ring similar to the one in this post?! Can you link it or ones similar? How funny! I'm wearing a poncho today. Love it! Gorgeous photos! I absolutely love the mix of colours & that poncho is to die for! Those booties are so stinkin cute! I need them! Loving all of your fall outfit posts! I always come to your blog for inspiration! Ponchos are so easy to dress up a simple outfit! How adorable is that poncho! Obsessed with all the colors! Ponchos are my go to outfit when I'm running late and want to be warm all day! I'm also so obsessed with these studded booties, so gorgeous! Your makeup game is killing it! Gorgeous as always. This is the perfect fall outfit! I have been loving ponchos, they're so chic and comfy! I hope you have a wonderful weekend! Obsessed with this and you look gorgeous! What a perfect fall poncho! I love it paired with the suede booties. I love this poncho Caitlin, it's so cute!